Radarsign offers a variety of pole and base options for use with our radar speed signs. A round aluminum or decorative black fluted aluminum pole is available for use with our radar speed signs. Our selection of pole bases includes square or octagonal aluminum bases, or a black decorative base for a more architectural look. 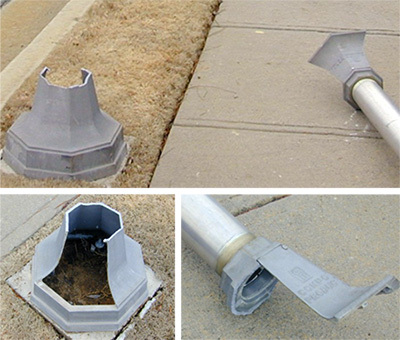 All Radarsign pole bases have a breakaway design that meets FHWA crash test guidelines. 14 ft., 15 ft., or 16 ft.. 12 ft.
All Radarsign pole bases have a break-away design that meets FHWA guidelines.Our bases are designe d to minimize damage and injury in the event of impact with the sign. In an incident where a Radarsign driver feedback sign was installed, a hit and run driver ran off the road and collided with the sign. The local police investigated the incident. It was estimated that the vehicle was traveling approximately 40-50 MPH in a 25 MPH zone when it crossed lanes and struck the radar speed sign. Radarsign’s pole base broke away from the sign pole on impact as it was designed to do. The radar speed sign sustained minimal cosmetic damage to the YOUR SPEED faceplate and the radar speed sign and solar panel remained operational and intact.